The Nikon D7100 leads the way for their DX-format line of dSLR cameras, as well as most of the other cameras with anything less than a full-frame sensor in image quality. Sporting the highest resolution and sharpest images in its class, it has no problem keeping up on the performance end either. Read more in our Full Conclusion. 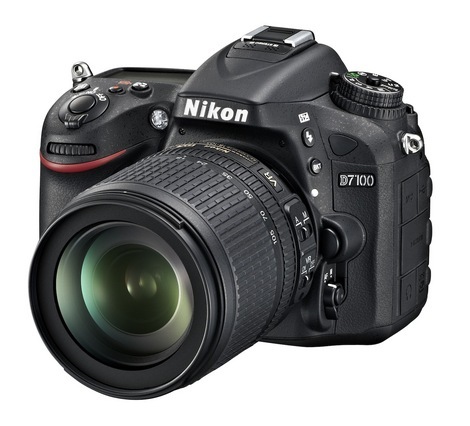 For 2013, Nikon has announced the new D7100 dSLR, or "HD-SLR" because this camera is designed to capture stills at a 24.1 megapixel resolution as well as Full HD video (1080/30p). This ruggedly built camera includes the same moisture and dust resistance as the Nikon D300S, and the shutter will last for 150,000 cycles. The EXPEED 3 image processor ensures blazing speed (up to 6 frames per second in full resolution) and sharp images in all lighting conditions, even when extending the ISO from 100 to 6400. While the D7100 is, of course, a professional series APS-C camera, they've still included options for those who are still learning about photography; with modes like Auto, Program AE, Shutter priority, and Aperture Priority. They even include various Scene modes. Nikon boasts an all new 51-point AF (Auto Focus) system for the most accurate exposure, color, and sharpness. For further customization, Nikon offers Picture Controls (for adjusting color, tone, and saturation) and Creative Effects (filters like Color Sketch and Selective Color to add or remove excess color) for still images as well as HD video capture. There's even a High Dynamic Range (HDR) mode to capture and combine multiple exposures to produce photographs "with a vast tonal range." Though digital zooms are rarely as good as they want to be, the Nikon D7100 offers up 1.3x crop mode, which serves as a 2x telephoto boost and captures images at a reasonable 15.4 megapixel resolution. In this mode, you can also record 1080/60i (or 50i) HD video and the high speed burst shooting increases from 6fps to 7. Like Nikon's other DX-format cameras, the D7100 is compatible with a full range of DX as well as FX-format NIKKOR lenses. There's also an enhanced interface, taking the form of the "i" button to quickly access frequently used functions. And, should you wish to control the D7100 remotely, or instantly share photos to social networking sites via an iOS or Android smartphone app, you can pick up the optional WU-1a Wireless Mobile Adapter. The Nikon D7100 dSLR sports a MSRP of $1599.95 for a kit that includes the AF-S DX NIKKOR 18-105mm f/3.5-5.6G ED VR lens, or $1199.95 for body-only. See our lowest price button at the top right of this page for the most current online pricing.